Whitecrow Village FASD Society was born in 1996 in response to a parent’s desire to structure an environment through which children affected by Fetal Alcohol Spectrum Disorder (FASD) could experience success at summer camp. For the first 2 years, the Village offered one 3 ½ week camp for children with FASD per annum, and it was financed “out of pocket” by a single government employee. By the third year, it became clear that in order for the children to experience continued success beyond the camp setting, it would be necessary for the greater community to learn to recognise the needs of and to witness the many strengths of people living with FASD. Thus, the inclusion of families, community agencies, and professionals at our week long Live-In FASD Education (L.I.F.E.) training sessions became an integral part of the heuristic Whitecrow Village community model. As the only one of its kind, the Whitecrow Village model rapidly drew the interest of families, community agencies and peoples across many social and professional domains, which, in turn, ignited a deluge of requests for more and more L.I.F.E. Sessions. By 2002, Whitecrow Village became a registered Non-Profit Organisation with an established Board of Directors and a growing team of volunteers, supporters, and contributors. 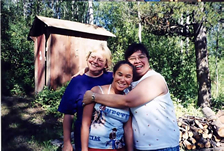 In 2003, Whitecrow Village camps “hit the road” and, blessed by generous donations and outside financial supports, Whitecrow Village has been able to serve communities further and further beyond the banks of its original home in Francois Lake, British Columbia, Canada. We’ve been travelling ever since and are working to acquire a permanent home base. Whitecrow Village FASD Society continues to build positive and healthy relationships with families and communities; social service agencies; legal, medical, and education professionals; and academics. In recent years, the success of Whitecrow Village has gained international recognition, and has been the subject of provincial FASD research initiatives.